There's nothing like a historic home to enlighten us about architectural styles and help us imagine what it was like to live in another time. Such houses can also provide inspiration for enriching our own homes and lifestyles today. 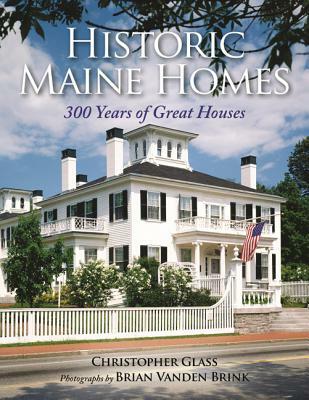 Architectural historian Christopher Glass and renowned architectural photographer Brian Vanden Brink bring their skills and perspectives to bear on celebrating Maine's historic houses. While Glass focuses on fascinating facets of architectural history, Vanden Brink demonstrates his eye for finding the perfectly lit moment and the best angles for bringing the houses alive inside and out. They open the doors on both public and private homes built in a rich variety of styles, including Colonial, Federal, Georgian, and more. While all of these houses were built in Maine, most are examples of styles that can be found in many parts of the United States. This is a book for the architecture buff, the person with a passion for older homes, for anyone who enjoys visiting historic properties, or for the armchair traveler who loves to tour places where others have lived. Christopher Glass has been an architect in Maine for forty years. His first book was At Home in Maine: Houses Designed to Fit the Land. He is the former architecture member and chairman of the Maine Historic Preservation Commission and has worked with the organization Maine Preservation. He also taught Architectural Design at Bowdoin College. He resides in Camden, Maine. Acclaimed architectural photographer Brian Vanden Brink's work has appeared in dozens of books, including his award-winning monograph Ruin. His photographs have also been published in numerous magazines, including Architectural Digest, Coastal Living, Custom Home, Fine Homebuilding, La Vie Claire, Old House Interiors, and Metropolitan Home. He lives in Camden, Maine.